Simple Gifts will be a series of short articles in December highlighting new, and not so new releases that make excellent Christmas gifts. One of the really positive outcomes from the growth of the super-budget labels has been the democratisation of modern music, with exciting non-mainstream composers being made available at taster prizes. Kudos to Naxos for their pioneer work in making modern music affordable, but now another really innovative super-budget label from Holland, Brilliant Classics, has come out with what I nominate as the one of the best new releases of 2006, and certainly the perfect Simple Gift. 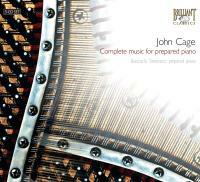 John Cage, Complete Music For Prepared Piano delivers exactly what it says on the can, and the can only cost me £10 ($19.66) from my excellent local independent record store. For that staggering low price I got three newly recorded CDs (the most recent recording was made in April 2006) in superb sound, with music ranging from solo prepared piano to Cage’s Amore for Prepared Piano and Percussion, and his Concerto for Prepared Piano and Chamber Orchestra. The prepared pianist is Giancarlo Simonacci, who is also a composer in his own right. He studied at the Salzburg Mozarteum with Aldo Clementi (composition) and Carlo Zecchi (piano), and plays in a piano duo with Gabrielli Morelli. These three CDs present challenging and exhilarating music, the recordings are excellent, and the beautiful packaging includes an intelligent essay on Cage by Emanuel Overbeeke. John Cage’s Complete Music For Prepared Piano, or a take-out pizza meal? No contest is it? I found this album far more impressive than I expected. Simonacci plays with considerable sensitivity and the recordings capture the nuances of the preparations very well, I think. My only real criticism is that it is NOT the "Complete music for prepared piano". Where, for instance, is "A Book of Music for 2 Prepared Pianos" of 1944? Surely it should have been included, even if it had to be done by overdubbing?